Water pathways through permeable riverbeds are multi-dimensional, including lateral hyporheic exchange flows as well as vertical (upwelling and downwelling) fluxes. 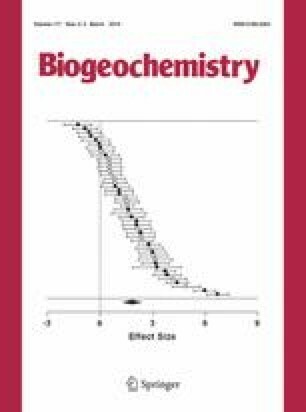 The influence of different pathways of water on solute patterns and the supply of nitrate and other redox-sensitive chemical species in the riverbed is poorly understood but could be environmentally significant. For example, nitrate-rich upwelling water in the gaining reaches of groundwater-fed rivers has the potential to supply significant quantities of nitrate through the riverbed to surface waters, constraining opportunities to deliver the goals of the EU Water Framework Directive to achieve ‘good ecological status’. We show that patterns in porewater chemistry in the armoured river bed of a gaining reach (River Leith, Cumbria) reflect the spatial variability in different sources of water; oxic conditions being associated with preferential discharge from groundwater and reducing conditions with longitudinal and lateral fluxes of water due to water movement from riparian zones and/or hyporheic exchange flows. Our findings demonstrate the important control of both vertical and lateral water fluxes on patterns of redox-sensitive chemical species in the river bed. Furthermore, under stable, baseflow conditions (<Q90) a zone of preferential discharge, comprising 20 % of the reach by area contributes 4–9 % of the total nitrate being transported through the reach in surface water, highlighting the need to understand the spatial distribution of such preferential discharge locations at the catchment scale to establish their importance for nitrate delivery to the stream channel. The online version of this article (doi: 10.1007/s10533-013-9895-4) contains supplementary material, which is available to authorized users. This work was funded by NERC Grants NE/F006063/1 and NE/F004753/1. The authors would like to acknowledge the support of Dr Paddy Keenan in helping to set up and maintain the field site and in undertaking a substantial part of the chemical analyses where rapid analysis was critical to avoid sample deterioration. We also acknowledge the Eden Rivers Trust and Lowther Estates in facilitating access to the site and the Environment Agency in giving consent to establish the experimental set-up in the river. This paper contains Environment Agency information © Environment Agency and database right.